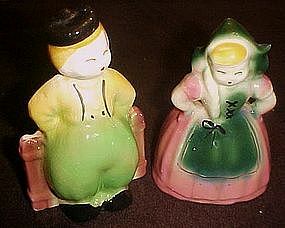 Here's a very nice pair of vintage pottery planters with a Dutch boy leaning against a picket fence, and a Dutch girl with hands on her hips. These are unmarked, but I have found out that they were made by McMaster Pottery of Hamilton, a Canadian pottery. The white clay indicates they are earlier pieces. The planters measures approx. 3 3/4 by 3 1/2 by 6 1/4 inches tall. There are no chips or cracks, and the coloring is vivid and bright. They are excellent! !